How does the dengue virus infect cells? To infect a cell, the dengue virus (counterclockwise, from upper left), binds to the cell membrane. The virus is then enveloped in the membrane, which coalesces around the virus, forming a pouch-like structure called an endosome. Deep inside the cell, the endosome membrane acquires a negative charge, which allows the virus to fuse with the endosomal membrane and release genetic material into the cell’s interior. Researchers have discovered a key step in how the dengue virus infects a cell. 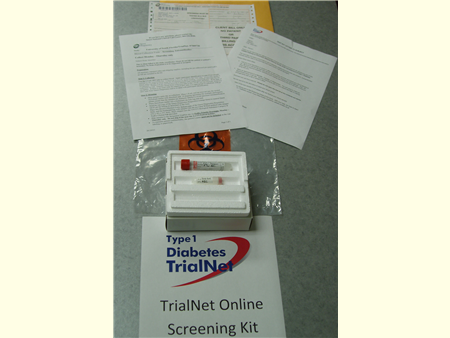 The discovery one day may lead to new drugs to prevent or treat the infection. Researchers from the National Institutes of Health discovered how the dengue virus releases itself from the protective membrane that shields it as it penetrates deep inside the cell. The discovery allows researchers to study the invasion process in the laboratory and provides a means to test potential treatments for the virus. Dengue, which is transmitted by mosquitoes, infects up to 100 million people each year. People bitten by an infected mosquito first develop a fever, followed by other symptoms such as joint pain, rash and nausea. Without treatment, symptoms may become more severe. Patients with the severe form of the disease, dengue hemorrhagic fever, may develop difficulty breathing, bruising, bleeding from the nose or gums, and breakdown of the circulatory system. Each year, 22,000 people — most of them children — die from dengue, according to the World Health Organization. To infect a cell, the virus binds to the cell membrane. The cell membrane engulfs the virus, enveloping it in a pouch-like structure known as an endosome. To begin the infection process, the virus delivers its hereditary material into the cytosol, the fluid interior of the cell, where it begins reproducing itself. To do so, however, it must first release itself from the endosome. The virus does this by fusing its membrane with the endosomal membrane. When the two membranes come together, they form a pore through which the virus’ genetic material is released. Graphic shows how the virus is taken into the cell and releases its DNA in the presence of a negative charge. To infect a cell, the dengue virus (counterclockwise, from upper left), binds to the cell membrane. The virus is then enveloped in the membrane, which coalesces around the virus, forming a pouch-like structure called an endosome. Deep inside the cell, the endosome membrane acquires a negative charge, which allows the virus to fuse with the endosomal membrane and release genetic material into the cell’s interior. Scientists have used their understanding of HIV to develop drugs that block the fusion process and infection. To study the fusion stage of viral entry, researchers have typically observed viral fusion at the cell surface and fusion of a virus with an artificial membrane. Researchers working with dengue, however, were unable to get the virus to fuse under either of these conditions. Why dengue, unlike other viruses, would not readily fuse with these membranes had puzzled researchers for years. The current study was undertaken by Leonid V. Chernomordik, Ph.D., of the Section on Membrane Biology at the NIH’s Eunice Kennedy Shriver National Institute of Child Health and Human Development and his colleagues, Elena Zaitseva, Sung-Tae Yang, Kamran Melikov, and Sergei Pourmal. 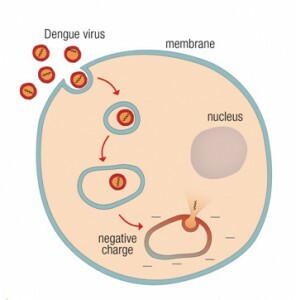 The researchers discovered that two conditions are necessary for dengue virus fusion—an acidic environment and the presence of a negatively charged membrane. They also discovered that these conditions are present at only certain points in the endosome’s journey within the cell. Their research was published online in PLoS Pathogens. To conduct their study, the researchers tagged dengue virus and cell membranes with molecules that would glow when the virus and membranes fused. They also exposed samples of the virus to an artificial membrane under various conditions, to identify factors that would allow fusion to take place. The researchers first confirmed that a protein controlling fusion is active only under acidic conditions. However, conditions in the endosome are always acidic, and this alone was not enough to guarantee fusion, they found. In additional experiments using artificial and cell membranes along with fluorescent markers, they discovered that fusion occurred only when the membranes were negatively charged. When the endosome begins its journey, the endosomal membrane has a neutral charge. The negative charge is present only after the endosome has been taken deep within the cell. “The confluence of acidity and a negative charge deep in the cell’s interior ensures that the virus is safe within the endosome early in its journey, when it is most vulnerable, but can release its genome when it reaches its destination,” Dr. Chernomordik said. Dr. Chernomordik and his colleagues plan to test various compounds to learn whether they can prevent the virus from fusing with cell and artificial membranes, in order to identify potential new treatments for dengue infection.